petition: Sign George Takei's Petition: Stand Up for Muslims in the U.S.
Sign George Takei's Petition: Stand Up for Muslims in the U.S. When I was just 5, my family was rounded up at gunpoint and forced from our home in Los Angeles into an internment camp. We were prisoners in our own country, held within barbed wire compounds, armed guards pointing guns down at us. 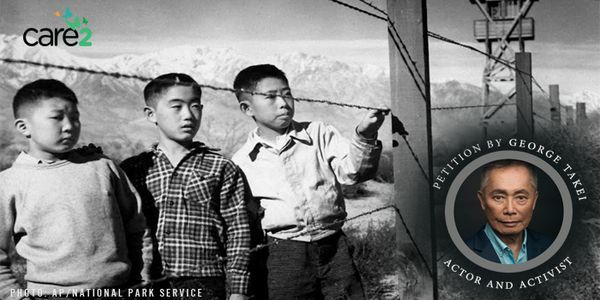 It was an egregious violation of our rights under the U.S. Constitution, all in the name of "security.” During that time, fear and racism drove government policy, creating a living hell for over 120,000 innocent Japanese Americans, most of whom were U.S. citizens. I have spent my life trying to ensure something like this never happens again. But dark clouds once more are gathering. A Trump spokesperson recently stated the internment of Japanese Americans during World War II "sets a precedent" for Trump to do the same today. And Trump continues to stand by his plans to establish a Muslim registry and ban immigrants from “certain” Muslim countries from the U.S. It starts with a registry, with restrictions, with irrationally ascribed guilt, and with fear. But we know well where it might lead. National security must never again be permitted to justify wholesale denial of constitutional rights and protections. If it is freedom and our way of life that we fight for, our first obligation is to ensure that our own government adheres to those principles. Without that, we are no better than our enemies. The day after the recent London attacks, Trump allies Nigel Farage and Katie Hopkins appeared on Fox News & called for mass internment of Muslims. "We want genuine action. And if there is not action, then the calls for internment will grow," Farage said. This is appalling. We must learn from the past and say we will #NeverAgain infringe on the freedoms of innocent people. Please share this petition with your friends to stand strong with the Muslim community. It’s happened. Trump's immigration ban is in full swing, and there is chaos at our borders and fear across our country and abroad. Please, we must stand with the Muslim community louder than ever. CALL your Senators and Governors and ask them to speak out. SHARE this petition on Facebook, your signatures will be delivered to the Muslim community soon.